Park Kwang Hyun and Kim Hyung Joon who are casted in KBS Drama’s Glowing She drama series were sending their new year greeting to fans through Facebook. 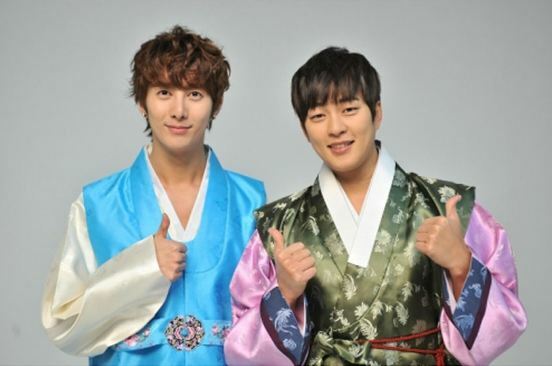 On December 30th, 2011, Park Kwang Hyun and Kim Hyung Joon made public their photo in Hanbok costume through official Glowing She Facebook fanpage. The photo is additional hanbok prepared when filming the official drama posters. The behind the scene video footage when filming the posters is expected to be released on the official Glowing She homepage (http://www.kbsn.co.kr/drama/jabal_girl/). In the drama, Park Kwang Hyun is playing the role of No Yong Woo, who is PD for the entertainment star, while Kim Hyung Joon is playing the role of top star Kang Min. Glowing She premieres on 10:40 pm of January 7, 2011.